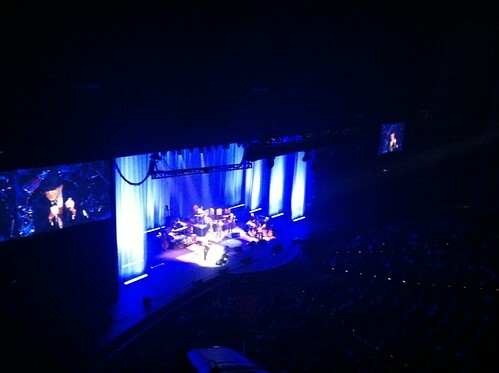 After all these years, I finally got to see Leonard Cohen, at the last night of his 3-year tour in Las Vegas. He played 30 songs, and for over three hours (that’s excluding the 20 minute intermission). I am not exaggerating when I say there is not at Leonard Cohen song I wanted to hear that he didn’t sing, and then some. We found tickets in the front row of the top balcony for $49.50. It’s the venue at Caesar’s that was built for Celine Dion; it’s new, the escalators work, there’s actual leg room, the sound was phenomenal, the sightlines fantastic, even up in the cheap seats. This wasn’t a typical Vegas crowd, I don’t believe – one, it’s LEONARD COHEN, and two, there were too many obvious superfans in the crowd down front. I overheard a conversation when I was in the ladies’ before the show, along the lines of people needing tissues, and not knowing what they would do with all their free time now that the tour was ending. You can laugh, but I have no grounds to mock someone else’s fanbase, having been in their shoes far too many times. Now, to the show: I was absolutely blown away. There is no doubt I love this man’s songs but I didn’t know how the performance would be. He was energetic – not even ‘for a 76 year old man’ but just plain energetic. The band was beyond stellar, the performances professional but imbued with emotion and actual feeling – beyond usual collaborators, there were no session dorks up there, or if there were, they sure didn’t feel like it. I was most surprised with my emotional reaction to hearing “Hallelujah” live. It was at that moment that I realized how much it meant to me to hear the man who wrote the song sing it in front of me, that it would have been a loss in my life had that never happened. I didn’t think it would happen with that song, I expected to feel that way more about, say, “Famous Blue Raincoat” or “Suzanne” (and I’m not even a huge fan of “Suzanne” but it is what it is). He was overwhelmed. He was gracious. He acknowledged the fans, and thanked them sincerely and repeatedly. The acknowledgment I found most appropriate was thanking the fans for keeping his music alive and making sure it wasn’t forgotten. He was dry and sardonic at spots; my comment was that I was glad to find out that Leonard Cohen is a sarcastic Jew, like the rest of us. I walked out of there simultaneously both emotionally drained and inspired. What an amazing body of work. What a tremendous contribution to the culture. What a life. I was at this show. It was my birthday. I saw him earlier on the tour here in Los Angeles. I’ve seen more than my share of shows in my day. This last one was the best I’ve seen. I was crying my eyes out at least half of the time. And I’m gratified as I read accounts like this excellent one to see that the experience that I and my companions had was not unique by any means.